Boil water for drinking, making ice, washing dishes, brushing teeth and food preparation. Water should be brought to a rolling boil for three minutes and cooled before using. Water for pets should be boiled and then cooled for their use. Dispose of ice from your refrigerator’s ice maker. DO NOT USE. Disinfect dishes by washing them in dishwashing machines that have a dry cycle or a final rinse that exceeds 113 degrees F for 20 minutes, 122 degrees F for five minutes or 162 degrees F for one minute. 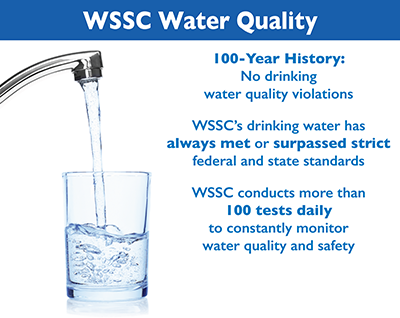 WSSC asks customers who were under the Boil Water Advisory need to take a few precautions. WSSC recommends running all cold water taps for five minutes. You should also flush your refrigerator's water lines. Customers and businesses should also dispose of any ice made since the precautionary Boil Water Advisory. The next three batches of ice should also be thrown out. Ice maker containers should be wiped clean with a solution of two tablespoons bleach to one gallon of water. If you still experience problems after performing the above procedures, or if you have any questions, please contact our Emergency Call Center 24 hours a day, seven days a week at 301-206-4002, 1-800-828-6439 or TTY 301-206-8345.